I don’t bake much for two reasons – 1) we don’t eat a lot of sweets and 2) I’m not so good at following directions. When I do bake it’s usually for a special occasion or when we have company over for dinner. I love just about anything chocolate and LOVE cheesecake. This recipe combines both AND it makes just the right amount. You can bake it in a 9″ round cake pan or use a pie plate (like I do). It tastes great warm or served at room temperature. It’s really, really good with ice cream and chocolate syrup. A wedge of extra moist, fudgy chocolate and cheesecake brownie – served with ice cream and chocolate syrup. So good! 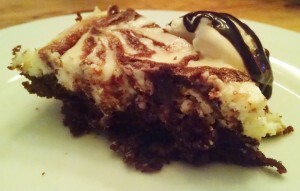 A recipe for fudgy chocolate and cheesecake brownies. Preheat oven to 350F. Grease a 9" round cake pan or pie plate. Melt the butter and chocolate over medium heat or in the microwave, being careful not to burn the chocolate. Let cool. Add 2 eggs, ½ cup sugar, flour and baking soda to a medium sized bowl. Mix well. Add cooled chocolate mixture. In a separate smaller bowl, beat the cream cheese, egg, ¼ cup sugar and vanilla extract. Spoon the chocolate mixture and cream cheese mixture, alternately, in the pan. 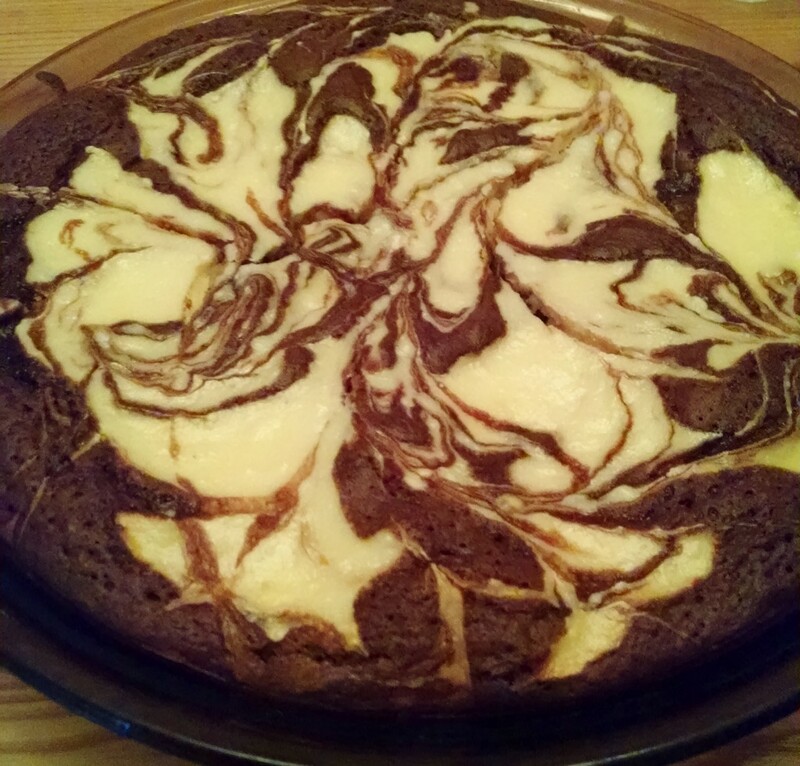 To create a swirled, or marbled effect, run a thin knife through the batter in the pan. Bake for 30 minutes, until a wooden toothpick inserted in the center comes out clean. Do not overbake. Otherwise, the brownies won't be fudgy. Let cool for 5 minutes (if you can! ), cut into wedges and serve.